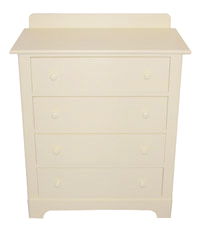 Our basic dresser features four large, smooth-sliding drawers and simple, attractive arches at the base. Measuring 32" x 19" x 36"H, the optional backsplash adds another four inches to the overall height and will prevent smaller personal items from disappearing beyond the back edge of the dresser top. Crafted in poplar, painted and lacquered for long life. Also available in cherry and curly maple.